The biggest reason why solar energy is growing is because it is cost competitive with other energy sources. 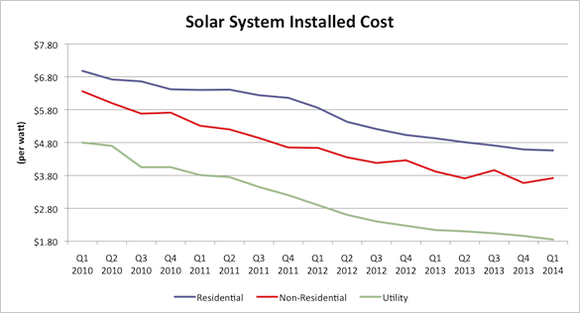 The chart below shows how fast system installation costs have fallen during the past four years, lowering solar energy’s cost to below grid parity in sunny or high-energy-cost regions. USA: Five 24kWh lithium ion batteries from old Nissan Leafs store electricity for Nissan’s test solar powered electric vehicle charging stations.